You are here: Home / Makeup / Is Microblading Worth It If You Have Oily Skin? Is Microblading Worth It If You Have Oily Skin? Microblading – is it worth it if you have very oily skin? I can’t tell you how many people have asked me about my eyebrows in the last few months! 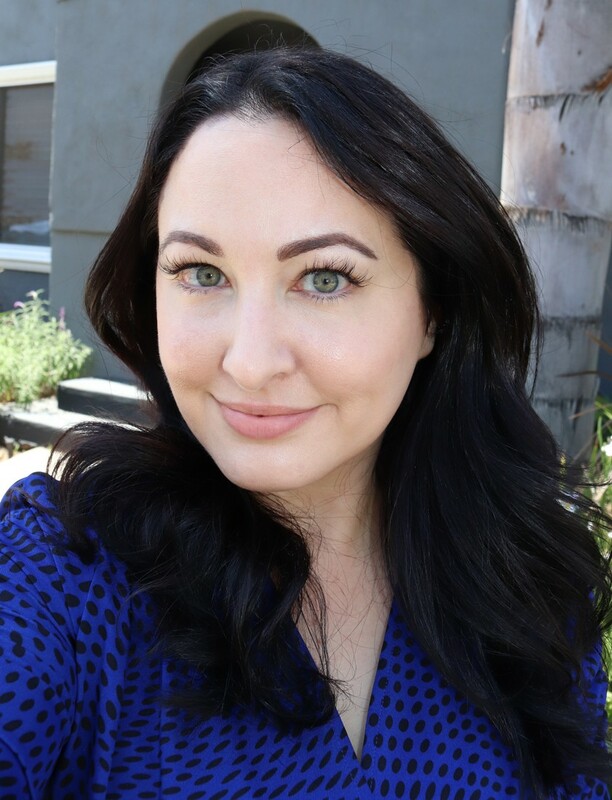 I recently had them microbladed by Kayla Weiss at Thread in Studio City. Everyone wants to know if microblading is worth it, if you can microblade oily skin, how much microblading costs and if microblading hurts or not! So let’s discuss, shall we? So first of all, what is microblading? Microblading (AKA micropigmentation, eyebrow feathering, microstroking, 3D eyebrows) is a semi-permanent eyebrow tattoo. 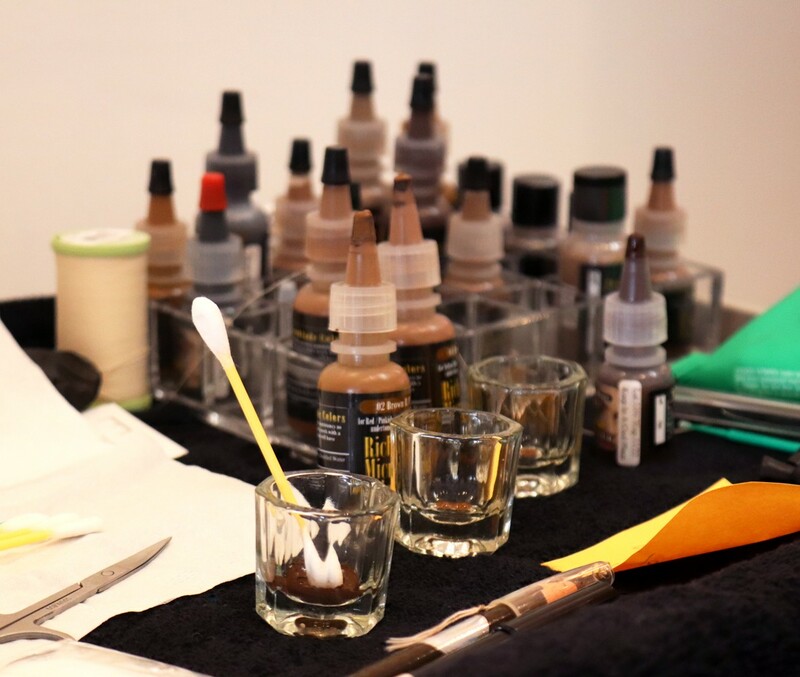 The brow technician will use a hand-held device (not a tattoo machine) to create natural-looking brow strokes. 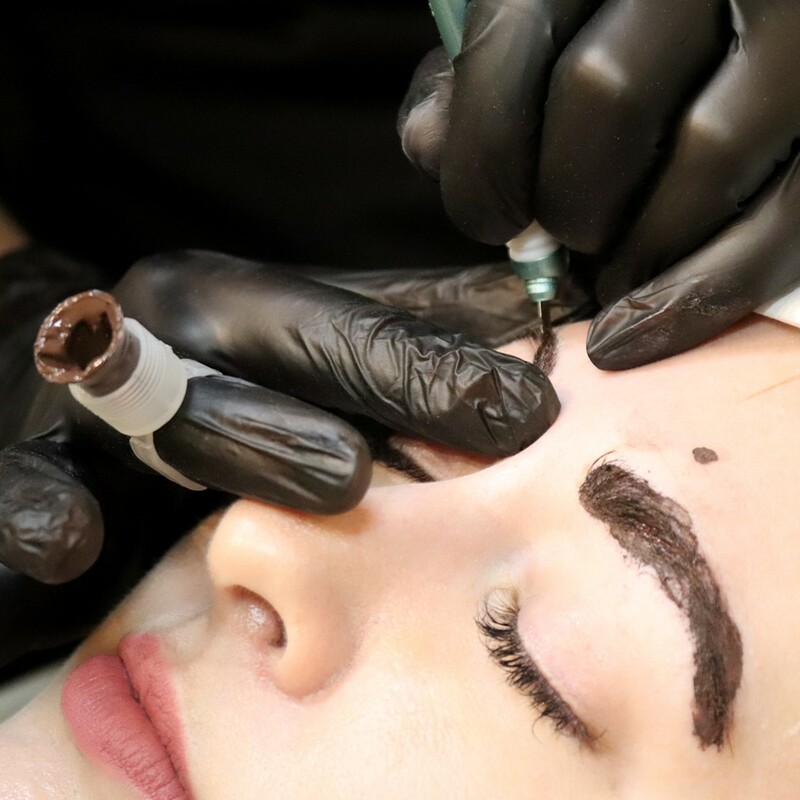 Unlike old-school eyebrow tattoos, microblading looks natural when done by a skilled brow artist, and the colors should not turn green or grey over time. Microblading can be used for people who have lost their brows completely due to overplucking, age, or chemotherapy/radiation. Or, it can be used to for people like me who have sparse gaps they’d like to fill. I first had my brows microbladed in Beverly Hills, by a very skilled (and very pricy) brow artist. You can read all about my experience as a first-timer here. My ink lasted roughly a little more than a year, and then I got a touch up a couple of months ago by Kayla at Thread Eyebrows in Studio City. You may be asking, “What does microblading cost?” First let me say, as a beauty blogger, I was not charged for any of my treatments, nor was I paid or expected to write a positive review for the exchange. But, I can tell you that at the time of this article, Thread microblading cost less than what my first microblader charged – somewhere in the neighborhood of $500-700 (see them for a consultation to get an exact price). In comparison, the other place (in Beverly Hills) was about $1,000 for the microblading session plus one touch up. Let me be clear about this: the one thing you DO NOT want to do is cheap out on microblading or any other type of permanent makeup (or any med spa treatment really). If someone is cutting into your face, please, please, please make sure they are professional, certified (laws vary by state), and MAKE SURE YOU VIEW THEIR WORK. Go on Yelp, read reviews, check out their Instagram before and afters – do your homework! Also – don’t get microblading done if you are pregnant or breastfeeding, or if you are using Accutane. There are other risk factors that your microblading professional should go over with you. Kayla did a very thorough job and I appreciated that she really took the time to get the ink color JUST right. My previous ink was a little too red and warm-toned, which may have been designed to match whatever hair color I was rocking at that time. Kayla spent a lot of time and helped me choose the perfect taupe to match my natural hair color. So, does microblading hurt? I’m not going to lie to you – yeah, it does. All good brow techs should use numbing cream. Some may tell you that you’ll get better results without numbing cream. If they say that, just run! Unless you’re really not sensitive, I would not recommend that at all. I found that the first time I barely felt any pain actually. But each time I got a touch up (the last one I got was number four), it hurt more and more. I think that may be because of a build up of scar tissue. I don’t have any raised areas or keloid scars or anything like that – nothing I can feel or see. But I think the scar tissue may still be there, and it might make each session more painful than the last. It wasn’t unbearable pain, and I’m VERY sensitive to pain in general, so I feel like if I can do it, anyone can do it. Honestly – I’m the biggest wuss. 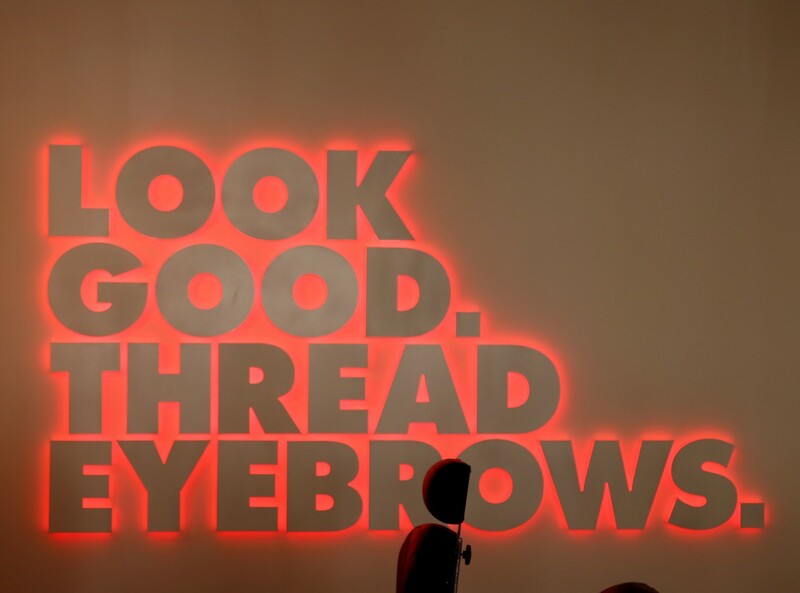 If you’ve ever had your brows threaded (which Thread also does! ), it feels a lot like that. And I should note that not every stroke was painful. I told Kayla it was like eating shishito peppers – some strokes were mild and some were extra spicy! Kayla had me bring headphones so I could listen to music while she worked, and that distraction made a HUGE difference for me. I definitely recommend doing that so you’re not overly focused on each stroke. Can you get microblading done if you have very oily skin? Well this is where my experience should come in handy for you guys. I have combination skin but I’m very oily in the t-zone and brow area. I’ve had four total sessions (including touch-ups) with three different technicians over the last couple of years. I saw Kayla twice within the span of about a month – she did a second touch up on me 30 days after the first one to fill in a few gaps. If you have normal to dry skin, this shouldn’t be necessary. Aftercare may make a difference too. I have tried a few different aftercare methods for microblading oily skin. The first two times, I didn’t sweat or let any water touch my brows for ten days after the microblading and I kept them “wet” with grapeseed oil. The third time (with Thread), I kept them “wet” with a special salve, but I washed them after 24 hours (only splashing my face with water – not scrubbing or getting them directly under the shower spray). The fourth time, I washed after 24 hours (and then daily thereafter) and didn’t use any salve (AKA the dry method). With all methods, I still made sure not to sweat for about 10 days or so. I kept an eye on my brows to make sure there was no infection (which can happen with any method but particularly with the dry method….or so I’m told). I never had any complications. Just the usual scabbing and itching (and the brows got very dark for a while, then lightened up as always). So which microblading aftercare method was best for oily skin? I think the dry method resulted in loss of fewer “strokes”. With the wet method, I saw some of the strokes come right off once the skin started to scab and heal. There wasn’t a huge difference, but I felt like dry method was a little better for me. I also noticed that no matter which method I chose, I ended up with what they call “powder brows” – basically the strokes feathered out and it looked like I had put powder on my brows. You couldn’t see each individual stroke once they healed. I have talked to other people, and it seems like that’s pretty much what you can expect if you have oily skin. It’s certainly not bad (some people prefer it actually), and I love how my brows look, but I do wish I could get the strokes to stick around! 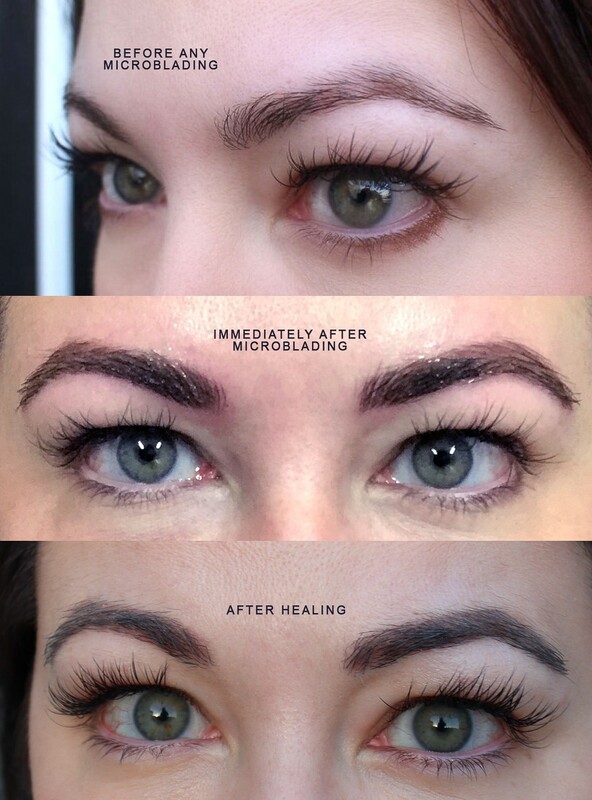 Here are some pics (above) to show you how they looked before and after the microblading. The first photo is before ANY microblading (before my first session a year and a half ago). You can see that my brows didn’t have much “shape” to them – and they were missing a lot of hair at the top. 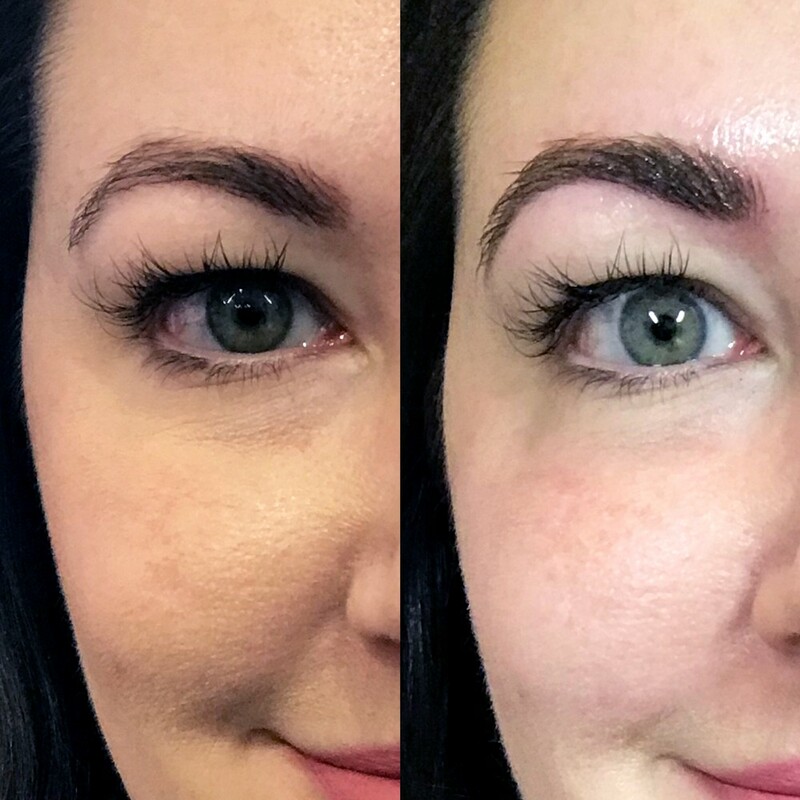 The second photo is immediately after my first microblading touch up at Thread – everything looks perfect. The third pic is about 30 days after my second Thread touch-up when everything had healed to a more “powder” look and some of the strokes had feathered out or come off. I could use a wax or thread session, but you get the idea! Click here to see a short video of how my brows looked right after the first Thread microblading session. Here’s another one (sorry for the grainy, low-light iPhone photos). The photo on the left is immediately before my touch up at Thread. You can see that my brow still had some pigment from the first microblading session about a year prior, but was definitely losing shape and sparse in some spots. They were also too reddish-brown and warm toned, although it’s hard to see that in this lighting. The pic on the right was taken immediately after my touch up at Thread. It looks so much more defined and healthy! I have since referred many people to Kayla at Thread and I recommend her highly. 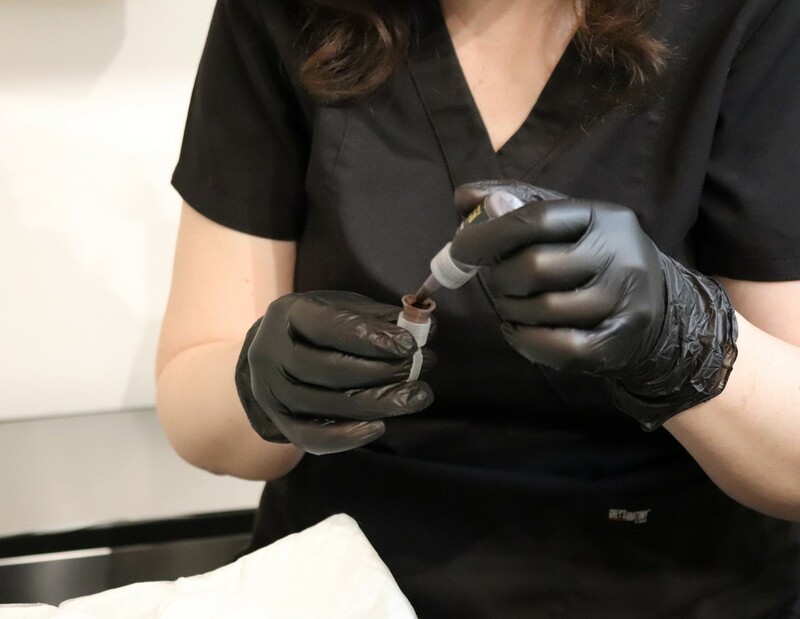 She is very good at what she does, and very particular when it comes to shaping the brows, getting the color just right, and cleanliness (which is so important!). It doesn’t hurt that she is super sweet as well, and makes you feel so comfortable. So is microblading worth it? My answer is HELL YES. It’s not cheap and it’s not pain-free, but it can change everything. I just needed a few spots filled in, but now I feel like I can wake up with perfect brows, and I don’t need to wear brow makeup anymore. I still enjoy using eyebrow makeup when I’m getting glammed up, but on most days I don’t even wear it anymore. And it’s awesome! I also rarely (if ever) get my brows waxed anymore. I find that with my new shape, it’s so easy for me to just pluck stray hairs and go on with my day. Before, I always felt like I needed a professional to shape them, because they never looked perfect. If you have VERY sparse brows or no brows at all, this can be a major life changer for you. Just make sure you go somewhere TOP NOTCH like Thread, because this is your face we’re talking about! Treat it right! If you go to Thread, tell them I sent ya and ask for Kayla! I want to go to her! You had really good brows to start with – I think it would be incredible to have the brows I’ve always wanted. Your brows look absolutely perfect! I asked my colorist about microblading for me, and she was a strong no vote. She said that they would never find a good shade for me. Oh really? Because of the red hair? I bet you could find someone to match it! In spite of being a blogger I know I won’t get a discount but the person I’m planning to see needs the money desperately due to a very sick husband. I am looking forward to doing this but I want the timing to be right. I bruise very easily so I need to wait until after an August wedding to do it. Your brows look just perfect! I have read so many mixed reviews about microblading but after your post and before/after shots I might give it a try. Your brows look absolutely perfect, Jen! Thank you for really giving such a detailed overview! Your brows look great! I just had my 6-week touch-up recently and I’m so glad I had my brows microbladed, it’s the best beauty decision I’ve made! It wouldn’t have even occurred to me that there might be a difference between oily and dry skin with microblading. Thanks for all the information. Your brows look great! First you do have beautiful brows! Have to admit just about fell out of the year when I read the price to start with. You are a brave lady I could not do it. I have oily skin so this is really good to know in case I ever decided to do it! I would love to get this done. As my brows are getting more sparse the more I pluck and wax as I get older. Yours look fabulous! Your brows look so great! And, they’ve continued to look great. I really want to try microblading. Really interesting. I wish I could afford to have it done. I think your brows looked good before but wow now they look fantastic! Great post! Your brows looks amazing!! You have gorgeous skin too!! I would love to have mine done but I am afraid they would mess them up. Oh I wish I could afford to do this…im so overplucked. Your brows look great! My daughter got this done and she really likes it, I think hers is too thick and looks fake but I would ever say so!! LOL But it isnt bad,,better than what she had which was bad half moon shapes. Not good at all. They look so good! I have been wanting to get my brows micro bladed because I am absolutely AWFUL at filling them in!